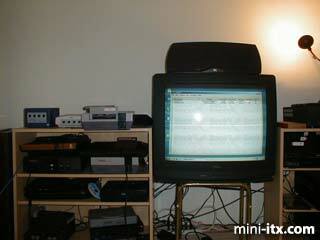 Console fanatic Flagon500 (not his real name - we hope) has got every console under the sun, but so far all attempts to assimilate Nintendo's First Born into his collection has resulted in a rather inert pile of grey bricks. 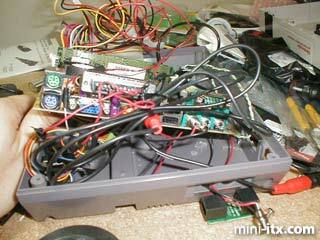 So one day he attacked one with his dremel, swapped out the lifeless innards with an EPIA 800, figured how to interface with the NES controllers, installed some emulation software and made... um... a NES. Read how he did it here (including how he persuaded the EPIA 800 to talk to his NES controllers with the aid of a soldering iron). Then look at 50+ images in the NESPC Gallery. 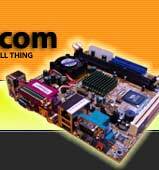 "Things we want converted into Mini-ITX"
Do you have a Mini-ITX based project we should be seeing here? Contact us at feedback@mini-itx.com with details, you'll win a delicious case badge. 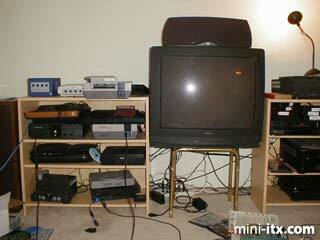 I was tired of the blinking screen on my TV whenever I powered up my beloved NES. I would clean the connector, and blow until I was dizzy, but the blasted thing still would not work. I bought quite a few of them for less than $5 at Good Wills, but most of them never worked. I can't stand emulators because you have to watch the game on your computer screen. 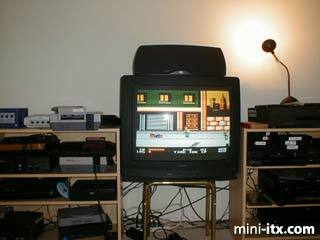 I wanted to play my games with original NES controllers on my TV. If you have more controllers, pins 1,5,6,7 all go to the same port for each controller. Pin 4 is the only one that changes and it goes on the pins following 10 (11, 12, etc). On pins 4-9, you are supposed to have diodes which allow current to go to the controller, but not backwards. You can use the cheapest ones that Radio Shack sells for this. 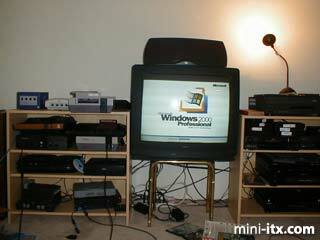 OK. Now that we have the controllers working, we need a way to play the games. The only emulator I could find that supported my controllers was RockNES, so the choice was easy for me. There are probably others, but who cares, this one works. The only thing I don't like is that I cannot select games with the controller - you need a mouse or a keyboard. Now we have a working system that plays games. It is now time to cram the computer into little NES box. 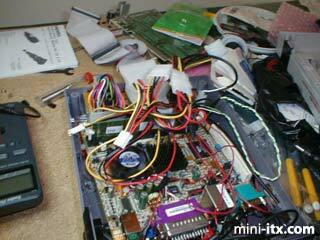 For this I used the EPIA 800 main board. It's super small and has on board TV-Out, Sound and Network (among other things). I added 256MB ram, 20 GB hard drive and installed Win2K. This board can use a normal ATX power supply. I did not have room for one, so I searched for an external one. The Morex Cubid 2677 has an external powersupply. 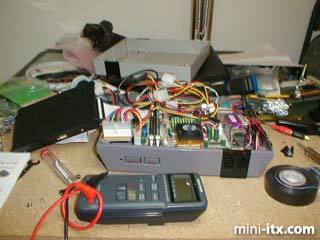 Instead of figuring out where they got theirs from, I just bought the case and stripped out the power supply. Next comes the fun part. Buy a cheap broken NES and gut it. Then take the dremmel and cut everything except the 4 screws in the corners. 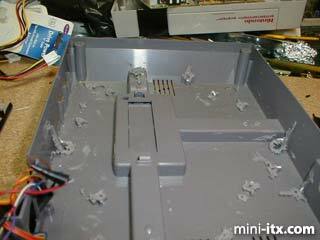 In the NES case, you need a spot to plug in the power supply, audio out, video out, and a network port. 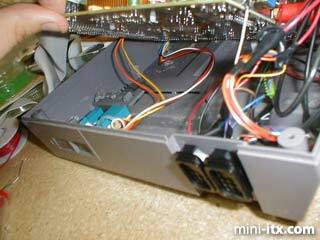 You also need the parallel port wired directly to the controller ports. 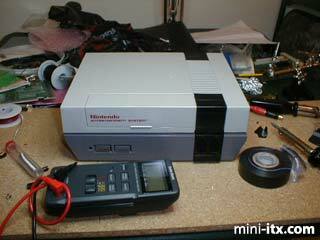 And, you need the NES's power button to turn the whole thing on. The original NES power button locks in place (AT Style). Since this is an ATX board, I just wired the reset button of the NES to the power input of the board. Now its time to put the lid on and test it out. I was too excited to properly mount the external ports, but who cares, I'll save that for a day when the power goes out - I want to play some games! A few side notes... I had to put it under my Master System because in all my excitement I lost the screws! I think I should add another fan because it might get hot in there.